Waters has reinvented Pink Flamingos as video art for his new exhibition. “I’ve become my own worst enemy and rewrote the script so that it’s G-rated,” explains Waters, who hired a cast full of children — most, he says, were friends’ kids — to do a costumed table reading that was filmed over the course of one day. 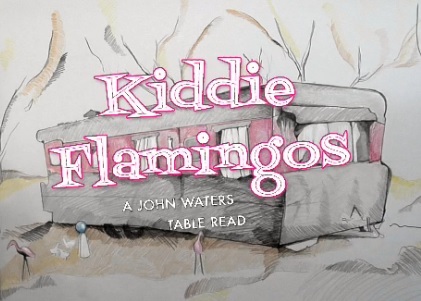 The 72-minute video, titled Kiddie Flamingos, pokes fun at the original. “I see it as a new kind of perversity not to ever make an X-rated thing again,” he said. 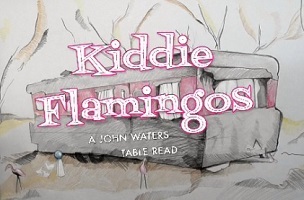 Binlot has an exclusive preview clip of Kiddie Flamingos, during which Waters can be heard reading some of the screenplay stage direction. Check it out and decide for yourself whether this was a wise Waters experiment.